December 20 will go down in history as a memorable day to turn the tide of Syria’s conflict. 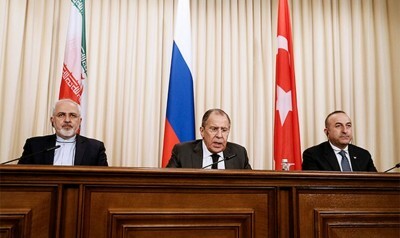 Russia, Turkey and Iran adopted a declaration on the immediate steps to promote the settlement of the Syria’s crisis. The three countries agreed to take on the role of guarantors to facilitate the process preserving the territorial integrity of Syria and spreading the cessation of hostilities to all parts of the country. Other states are welcome to join. The declaration is just a start, the efforts by the three parties will continue. The document was signed by the three countries’ foreign and defense chiefs at the December 20 meeting in Moscow. Russia, Iran and Turkey will fight together Islamic State, Jabhat al-Nusra (Jabhat Fatah al-Sham) and other extremist groups. The parties are ready to mediate a deal between the Syrian government and opposition. They considered the proposal of Russian President to convene a meeting between the Syrian regime and opposition groups in the Kazakh capital of Astana, taking the crisis management process into their hands to achieve real results – something international efforts in other formats have failed to do. Kazakhstan President Nursultan Nazarbayev discussed the possibility of a meeting between the Syrian conflicting parties in Astana with the presidents of Russia and Turkey on December 17. It mirrors the understanding that a political solution can only be worked out in cooperation with the Syrian government. President Bashar al-Assad has consolidated his power despite US calls for him «to go». Russia. Iran and Turkey are the leading pertinent actors who can really influence the events on the ground in Syria. The effort is undertaken after the hopes to reach an agreement with the US and the coalition it leads have been dashed. No result has been so far reached within the framework of UN-brokered International Syria Support Group. The tripartite talks were held after Aleppo had been retaken from the militants to change the situation in the war-torn country. Russia, Iran and Turkey were parties to a ceasefire agreement there. The truce allowed to evacuate tens of thousands of civilians and the militants who have agreed to stop fighting and be transferred elsewhere. This successful initiative provides an impetus to enlarging the effort to other parts of Syria. Russia and Turkey said the assassination of Moscow’s ambassador to Ankara, Andrei Karlov, will not affect their relationship as both countries face the common threat. During the December 20 meeting, Russian Foreign Minister Sergey Lavrov said the tragedy would «make all of us fight terrorism more decisively». A team of Russian investigators has been sent to Turkey for taking part in a joint investigation into the shooting. The top Russian diplomat said his meeting with the Turkish counterpart, Mevlut Cavusoglu,, was now «all the more relevant.» Dmitry Peskov, Russian president’s spokesman, said the assassination would not harm the negotiation process in any way. «The answer to the murder of the Russian ambassador to Turkey must be strengthening the fight against terror», said Russian President Vladimir Putin. The three parties joining together on Syria indicates a major shift in the balance of power with the US influence further declining. The US-led coalition has failed to make any significant gains during «strategic» offensives in Mosul and Raqqa against the background of quick and spectacular success of Russia-supported forces retaking Aleppo. The Aleppo victory greatly diminishes the US status as power broker. The joint declaration reflects the progress achieved by Russia in developing cooperation with Ankara and Tehran. For instance, Turkey, a NATO member, is in talks with Russia regarding the purchase of advanced S-400 long-range air defense missile systems. The parties are studying the prospects for boosting military cooperation in all areas, including procurement deals in electronic systems, ammunitions and missile technology. The related issues were discussed during the visit of General Hulusi Akar, the head of the Turkish armed forces’ General Staff, to Moscow on November 1. Russia and Turkey are on the way to implement the ambitious Turkish Stream gas project. The progress is made against the background of worsening ties between Turkey and the US and its NATO allies. Ankara has been angered by what it sees as lukewarm condemnation by its Western allies of the abortive July 15-16 coup. President Recep Tayyip Erdogan said in November that he was disillusioned with the US policies in his interview with CBS 60 Minutes. Turkey’s officials have complained about NATO’s unwillingness to cooperate with Turkey. Ankara is mulling the possibility of joining the Shanghai Cooperation Organization (SCO), or Shanghai Pact. Turkey is a major Eurasian power. Its integration into the Eurasian system is a logical step to make. The relations between Russia and Iran have grown warmer since the Joint Comprehensive Plan of Action (JCPOA), or the Iran nuclear deal, became effective. President Vladimir Putin visited Iran last November – his first visit after 2007. There are lucrative economic projects on the bilateral agenda. The two countries regularly discuss military planning for Syria, where Iran has provided ground forces that work with local allies while Russia provides air power. Russian warplanes have used Iranian airfields to strike terrorist targets in Syria. The militaries hold join exercises. Russia has delivered modern S-300 air defense systems to Iran. The foreign ministers of Turkey and Iran have recently pledged greater cooperation on resolving Syria’s crisis, vowing to keep the dialogue open despite their differences. Iranian Foreign Minister Mohammad Javad Zarif said that Iran was «ready to work and cooperate» with Turkey and Russia on the issue of Syria, adding that it welcomed «the new cooperation that has started» between Moscow and Ankara. The significance of the declaration signed in Moscow on December 20 is hard to overestimate. This is an international effort undertaken by the states that have forces on the ground to really influence the situation in Syria. With Aleppo retaken and the future policies coordinated, peace appears to have a chance in the war-torn and long-suffered country. This is a great opportunity not to be missed.